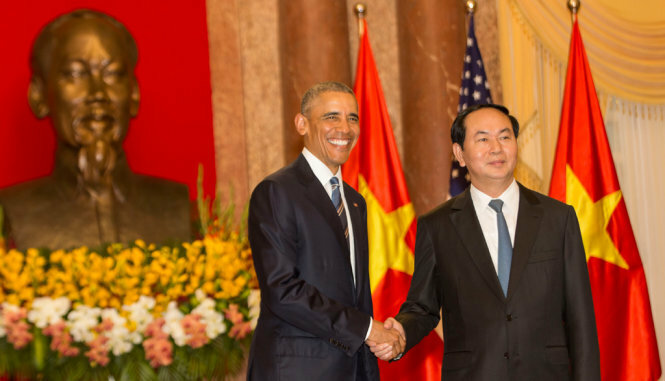 (May 23rd, 2016) The Obama administration announced Monday that the United States would fully lift the U.S. embargo on arms sales to Vietnam. Mr. Obama did not say this openly, but everyone knows that the decision mostly reflects growing concerns about China’s military clout and particularly its militaristic expansionism in the South China Sea. More generally the dramatic news shows the warming bilateral ties between the former enemy nations in a wide range of sectors, including economic and cultural. Two years ago, the administration eased portions of the arms embargo that had been in place since 1975. The aim was to help bolster Vietnam’s maritime security in the South China Sea, where China’s move to exert more naval control of crucial shipping corridors has angered Vietnam, the Philippines and other nations that have claimed sovereignty. It has also upset the United States, Japan, India and many other nations, especially given that 30 percent of world trade goes through the South China Sea. Obama said the latest step “was not based on China or any other considerations. It was based on our desire to complete what has been a lengthy process of moving towards normalization with Vietnam.” That was a careful diplomatic remark. Again, the move is clearly aimed at discouraging China from further adventurism in the South China Sea, which has involved, among other things, building military installations on disputed reefs and islands.